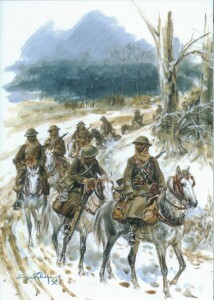 The 7th regiment of the Algerian Spahis and the 5th regiment of the Moroccan Spahis took part in the final attack against the Nazi-army by the allied troops during the harsh winter of 44-45. Even in the time of motorization these cavalry horses were still valuable. They were part of the French army from North Africa. Contrary to their native training, here they are active in the European winter weather. The endurance of the Barb horses (a variety of the Arabian breed) and their riders was proven in this cold weather and muddy terrain. The leading horse still shows its proudness in the difficult situation. In the Barb and Arabian breed there are many greys, which is also visible in this group. The Spahi horses traditionally wear eye-flaps, which are only common in harness horses. Eugène Leliepvre was a painter of historical uniforms but also excelled in this historical scene of a recent time. Installation of perspex material with printed skeleton, 400 cm high, 600 cm wide, until 2005 on the Koningsplein, The Hague, The Netherlands. 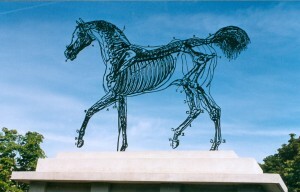 The artist has chosen the skeleton of a horse with indications to all anatomical parts just as occurring in textbooks dealing with knowledge of the horse. We can consider it as an ode to the historical education about the horse, which was essential for anybody who worked with horses for transport, agriculture and military activities until about 1940. For this historical subject the artist has chosen a combination of modern material and traditional processing. The shape of this horse and its posture reflect the Arabian breed, which is often chosen in illustrations just because of its elegance. This work of art collapsed from its socle after a storm in The Hague, was re-erected but collapsed for the second time and was never again re-erected. Photo: Donald Brown.